A brick faÃ§ade on an apartment building in Yonkers came down in late April and an engineer has begun to test the renovated faÃ§ade to make sure it is safe. Keith A. Kleinick is a licensed Structured Settlement Broker Consultant with Creative Capital Inc. dedicated to working with clients to craft solutions and tailor products that meet their specific individual situations. With years of experience and expertise in working structured settlement consulting and brokerage, Kelth A. Kleinick Esq. and Creative Capital Inc. are uniquely positioned to facilitiate settlement processes and support approaches that work favorably for everyone. In any situation where parties negotiate a payout over a period of time in taxable or tax-free situations, we now have the ability to use a structrued settlement approach to help the parties achieve a better settlement. Structured settlement is a term of art used to describe the settlement of a tort claim by way of a series of future installment payments. These payments are made at fixed dates in the future and are often monthly payments or lump sums although virtually any type of payment arrangement can be structured. The use of structured settlements has grown in popularity over the last 15 years as insurers have aggressively marketed them as a cost effective settlement tool. If you or someone you know is currently receiving compensation payments for injuries sustained due to a construction accident, contact a New York licensed structured settlement broker for more information about how a structured settlement can help you! The settling accident victim is often given a choice between a lump sum (for example $100,000) or a series of future payments (e.g. $1,000 per month for 240 months). Since the present value of the future payments is usually not disclosed to the victim, they will often accept the installment payments under the mistaken belief that they are worth more than the lump sum (ie. they believe, wrongly, that $1,000 per month for 240 months is worth $240,000 when in fact it is worth considerably less). The cost of the annuity is based upon the annuity insurer's current annuity rates and the age of the annuitant. Each carrier has its own rate schedule and will lock in a rate while the court reviews the proposed settlement. If the annuitant has a significant injury or condition (regardless of whether it is related to the lawsuit) which would lower normal life expectancy, the agent/broker should submit the annuitant's medical records to seek a ''rated'' age which would reduce the cost of the annuity. It is the responsibility of petitioner, counsel and the agent/broker to obtain the best rate considering all factors (including life expectancy) and to assure the court that all cost savings will inure to the benefit of the annuitant/claimant, and not to any other person or entity. (1) Acknowledge receipt of a copy of all of the structured settlement terms, as provided by General Obligation Law §5-1702. (2) Acknowledge receipt of a copy of counsel's affirmation in support of the proposed structured settlement. (3) Acknowledge that all of the above was fully explained by counsel, and consented to by the petitioner. A structured settlement specialist is a licensed life insurance agent/broker that specializes in placing such periodic payment annuities. An ''annuity issuer'' usually sells a structured settlement annuity only through an agent/broker that is authorized to be such for the ''annuity issuer''. These specialists are generally authorized to be an agent/broker for many annuity issuers. In many instances, it is defendant's liability insurer that selects the specialist. However, nothing precludes plaintiff/petitioner to designate its own specialist so that a competitive alternative proposal can be submitted to the court for consideration. The standard commission for such specialist is a one-time commission of 4% of the annuity cost paid by the annuity issuer. When more than one specialist is used, this one time commission can be shared. Of course, in a depressed interest market, even with inflation guard protection, the tax free return achieved may be less than that attainable when interest rates increase and return to ''normal''. One respected specialist claims to have created an investment ''structured settlement'' within the meaning of new product, which allegedly qualifies as a New York State law, but which, although not exempt from income taxes under Section 130 of the Internal Revenue Code, provides the flexibility to adjust to rising interest rates and inflation. This is purportedly accomplished by a permitted and qualified assignment of a portion of the settlement fund to a trust with major bank, as trustee, which then manages the portfolio pursuant to the order of the court. Namely, the ''assignee'' of the periodic payment obligation is a corporation which is usually an affiliate of the annuity issuer, the ''annuity issuer'', and the ''guarantor'' of the assignee; each of which are usually major life insurance companies that have superior ratings. The ''assignee'' corporation will use the settlement funds to purchase and own the annuity in accordance with IRC § 130. The Life Insurance Company Guaranty Corporation of New York provides $500,000 of protection with respect to a structured settlement annuity in the event an annuity issuer becomes insolvent if the annuity issuer is licensed in New York and the plaintiff is a New York resident. In view of this, where the amount structured is more than $500,000, it is prudent to purchase annuities from more than one issuer to keep the cost of each annuity below $500,000. This guarantee is in addition to the guarantee which must be provided by a "Guarantor'‘ of the assignee. Here at Kleinick Law we use our many years of experience in handling slip and fall cases to investigate every possible factor that would cause an accident, and to ensure that you receive full compensation for you or your loved one's injuries. 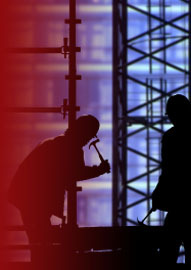 Servicing injured construction workers throughout New York City (NYC) including Manhattan, Bronx, Brooklyn, Queens, and Staten Island.